- Publisher What is the response when a child points out that a disabled child or adult looks 'different'? Shriver tells the story of Kate, who finds that making friends with a mentally retarded boy helps her learn that the two of them have a lot in common. 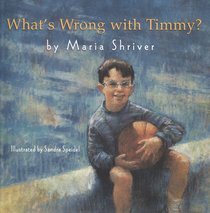 About "What's Wrong With Timmy?" What is the response when a child points out that a disabled child or adult looks 'different'? Shriver tells the story of Kate, who finds that making friends with a mentally retarded boy helps her learn that the two of them have a lot in common.